A few weeks ago my friend and fellow RippinLip Outdoors pro-staffer Bill Kohls told me that he would be fishing the Warriors on the Water tournament this year. The tournament pairs a volunteer angler, and their boat, with a military serviceman or servicewoman. This year the tournament was slated for Friday, April 29th. Since Bill had a few days off from work, we decided to get together and pre-fish as well as shoot some video for RippinLip Outdoors. Plus, how could I say no to a boat ride...a rare treat for me these days! Whether 'Warriors on the Water' or the kayak version 'Heroes on the Water' - it is a very worthy cause! We hit the lake around 7:30 AM on Tuesday morning. We to the south end of the lake and up the Haw River to a creek arm. It was already too late to throw topwaters, at least under the fairly clear conditions, so we started with crankbaits, soft plastics, and jigs. We quickly noticed that the fish were not eating anything except plastics and jigs. They wanted a fairly slow presentation and were off of the bank 5-10 feet. I knew this meant that a) the post spawn period had arrived and b) it is officially summer pattern time in North Carolina. In other words, it is time to stock up on your favorite plastic worm. We were running and gunning all day - catching fish at the south end of the lake with some regularity. However, we didn't get nearly as many bites on the main lake. We ended the day with about 15 fish between us and a pattern we thought would hold through the weekend. The day was paritcularly tough for me as I lost a couple 3+ lb fish due to some bad luck. Bill also had a nice fish break his line in some heavy cover. 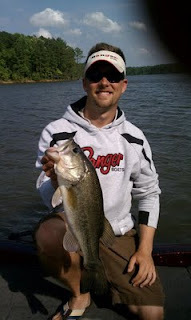 Most of the fish were around 13"-15", but we caught a few good ones. The best baits for the day were the Zoom Trick Worm in June Bug color rigged on a shakey head and the Deep Creek Lures 9" MT worm texas rigged. On Wednesday I had planned on pre-fishing for my "Battle in the 'Boro" Tournament on the 30th, organized by the NC Kayak Fishing Association (blog soon to come). However, Bill and another friend were very familiar with the lakes available to fish for the tournament, so they gave me enough insight that I felt comfortable fishing it without practicing. Instead, I headed back to Jordan with Bill. This time we hit the water, ran down lake, and were fishing by 6:30 AM. If you do the math, that means a 4:45 AM alarm bell for two sleepy anglers. Anyway, we arrived at a spot where we thought we could catch some fish on topwater. We were seeing a lot of shad, but not many bass chasing them. Finally, the wind picked up a little and Bill caught a decent fish on a Zoom Fluke. About ten minutes later it started to get windy, cloudy, and rainy. We came to a wind blown point with some grass - a perfect buzzbait target. On the third cast my R&S Baits Chatterbuzz got blasted. The fish was bending my 7'6" Carolina Custom Rod to the max. Finally, I got the beefy 4 lb bass to the boat and Bill got her in the net. After a few pictures, we set her on her way. We also caught the bite on camera. This shot was awesome in real-time and made me realize just how much equipment, computer software, and talent you need to make top notch fishing videos. Shortly after, the rain passed and wind died down. We kept fishing and landed 8 bass in the next hour and a half. We were catching them on plastics with regularity and feeling good about our pattern. We decided to leave the river and fish a main lake cove for a while before putting the boat on the trailer. We got there and on my second cast I hooked into a nice, 2.5-3 lb fish. Bill was setting up the GoPro Hero HD video camera as I did so. Check out the clip below for just how close we were to disaster! As you can tell, we both laughed it off thanks to Bills diving save. It only took a few seconds, but in real time it felt like slow motion watching that green cord sink. I was extremely glad that the GoPro is waterproof...and that I tied a piece of cord to it, which is typically fastened to a cleat on the boat. After this near miss, I attached the suction cup to the boat (properly) and tied the cord to the cleat. One near miss was enough for me! We ended the day around 12:30 PM with close to 20 fish. We felt good that Bill would catch plenty of fish on tourney day with his military partner, but knew it would take 5 solid fish to place at the top. On Friday, Bill let me know that they had caught about 12 fish. However, nearly every fish was around 13" and only 1 kept - a 4 lb fish caught on a fluke. He was pretty frustrated and I was bummed for him. I was just hoping that his result wasn't an omen of things to come for me in my tournament the next day. Why yes, Bill is wearing the same clothes for the third day in a row! However, Bill also told me that it was a top notch event and that his co-angler was a great guy. The tournament organizers provided food, gifts, and behind the scenes tours of Fort Bragg. I have a feeling Bill will try and do it again next year if he can. If you are out there on the lake right now you may still find a few bedding fish, but they are moving toward deeper water to catch up on energy and R&R. I like to look for banks with fairly quick/deep drop offs, particuarly those with wood cover or grass. 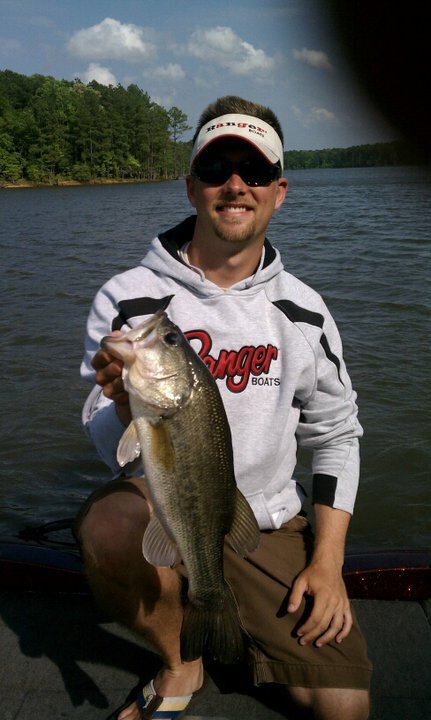 These areas often act as transition zones for bass between the shallows and deeper channels. In these areas I find that you can catch some bass looking for an easy meal. For me, post spawn is about plastics and topwater. And, if you aren't getting bit in an area you have confidence in, try slowing down and fishing a little deeper. Remember that wind, as always, plays a big role in where and how fish stage during the post spawn. Good luck to everyone out on the water and, as usual, tight lines!